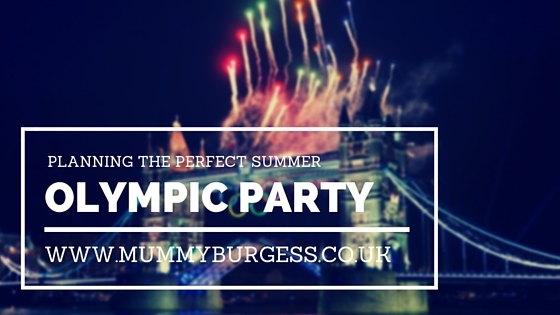 The Olympics are almost here and we at Mummy B HQ we are getting super excited. The 2012 Olympics were magical, being hosted in London and it was also the summer my daughter made her entrance to the world, made for some memorable moments. Now four years on, we have two children, who are both incredibly energic and love to keep active - Darcie and (even though he is only 10 months) Henry seemingly enjoy watching sports also - Darcie taking a particular interest in running and Tennis, both of which she enjoys doing herself. So this year, to encourage this interest going, we've decided to throw a little Olympic BBQ to get us really in the spirit for the games. We've recently started our garden project so it's a good excuse to enjoy our new outdoor space and make the most of the British summer. I have started to make plans, there will definitely be some themed food treats and loads of activities for the children to do in the lead up to the BBQ, like creating our own Olympic torches and flag buntings! We would also like to play a few party games or even create an assault course for the children to play on. I'm getting super excited about this and have been busy pinning away on Pinterest and saving ideas that could be perfect for the event. I have created a Pinterest Board to keep my ideas together and inspire others and I would love to hear if you have any Olympic themed activity/party ideas that I could perhaps include. Are you a super fan of the Olympics? If not, this will definitely get you in the spirit!